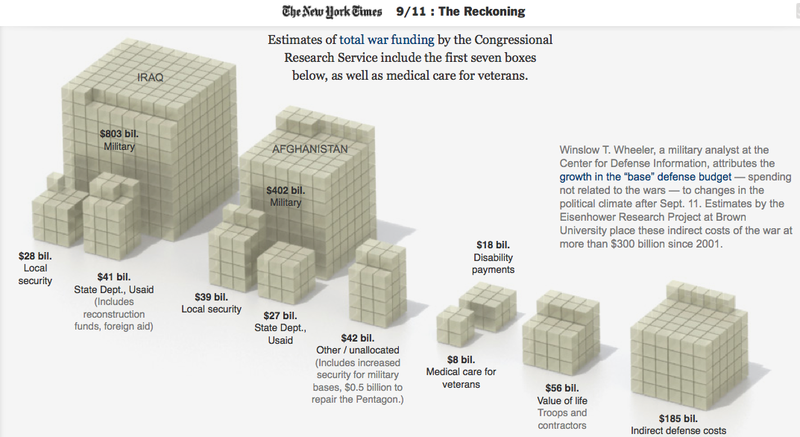 The NY Times is running a great graphical depiction of the costs of 9/11 ~ which they compute to be $3.3 trillion. About half of that, $1.649 trillion is attributed to war funding (Irag and Afghanistan). The breakdown can be seen at left. As a nation, we chose to fight in Iraq and Afghanistan, but chose not to pay for the conflicts. This decision has led to greater accumulated national debt ($14.5 trillion and rising, roughly $1.2 trillion of which we owe to China). Admiral Michael Mullen, as Chairman of the Joint Chiefs of Staff, famously said that our national debt is the greatest threat to American national security. Edward Mead Earle wrote an article in the 1940s about Adam Smith, Alexander Hamilton, and Friedrich List and the “economic foundations of military power.” In it, he reported something startling and counterintuitive ~ that the most committed market economists were similarly committed to pay-as-you-go military forces and operations. Perhaps, at the time the two wars began, it was a sound economic decision to put the conflicts on the national credit card. When the wars continued for longer than early estimates predicted, and direct combat turned to armed nation building and counterinsurgency, it would have been prudent for the administration to change course for the wars financial support. While challenging politically it would have been both the correct thing to do and important for the overall long-term health of the nation. As a result of the abdication of a fundamental tenet of American war-fighting, the nation has become relatively apathetic to Iraq and Afghanistan, and the country has lost relative economic, political and military power to the rest of the world (most notably China). I came to this page and some others through google search after learning about the current NATO exercises in the black sea. I am really in agreement with the conclusion of this post where the last line says most notably China. That is exactly what I think too. Though this article is from 2011, I see this corelating some current events. I liked the post at http://www.awaitedelement.com/2015/03/new-world-order-nato-exercise-11-march.html as well. There is really the economic connection to all wars and I wonder what if we get rid of economy at all at a global point?